In a Q&A with members of the press in 2008, Steve Jobs commented Blu-ray as "a bag of hurt". He said that "I don’t mean from a consumer point of view. It’s great to watch movies. But the licensing is so complex. We’re waiting until things settle down and Blu-ray takes off in the marketplace before we burden our customers with the cost of the licensing and the cost of the drives." Because of Sony’s licensing policy upon Blu-ray, currently Microsoft and Appl have not included the native support for Blu-ray playback. Therefore, naturally, if you need to play Blu-ray ISO file on Mac, you need to turn to some 3rd-party Blu-ray playbackup solutions. This post will introduce you 2 ways on how to play Blu-ray ISO file on Mac. Some basic knowledge is also introduced here. No matter you’re going to play Blu-ray ISO file on Mac or enjoy Blu-ray movie in disc/folder on Mac, you need firstly make sure you’ve got Blu-ray player software installed on your MacBook or iMac. QuickTime is not friendly with Blu-ray ISO file and other Blu-ray files, so don’t rely on it. You need to turn to some 3rd-party Blu-ray player software. As to what Blu-ray player software to get, you could refer to the Part 2 of this post. It should be noted that if your Blu-ray files are protected, you need to get Blu-ray player software that could remove the disc protection and break region code restriction so as to play Blu-ray file on Mac smoothly. In case you need to play Blu-ray disc on Mac, far more than simply playing Blu-ray ISO file on Mac, you need to get a Blu-ray drive connected with your MacBook or iMac. Currently, Apple hasn’t included Blu-ray drive in their MacBook or iMac, therefore you need to purchase a USB Blu-ray drive from your local stores or online retailer stores like Amazon or BestBuy. You could get as many choices as you search. Compare them and get a desired one. Internet connection is required once you try to play Blu-ray disc on Mac or you want to play protected Blu-ray files on Mac. Some Blu-ray player software would help you remove the protection upon Blu-ray files for smooth playback, with the help of Internet connection to access their online database. It would be quite simple to play Blu-ray ISO file on Mac free with Blu-ray ISO player freeware for Mac. The only thing you need to get ready for is free Blu-ray ISO player Mac. 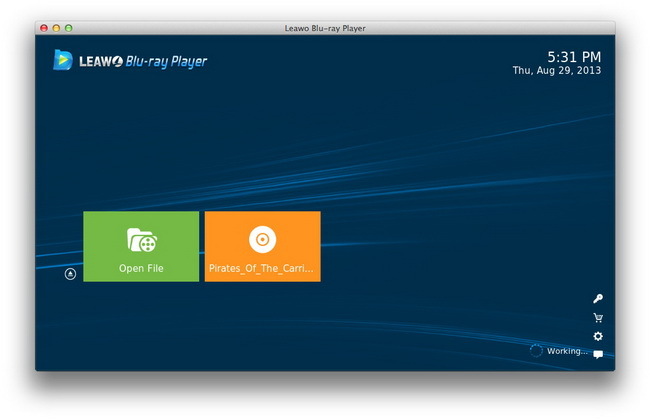 Leawo Free Blu-ray ISO Player for Mac is highly recommended. This free Blu-ray ISO player Mac is a comprehensive and free Blu-ray player for Mac users to play Blu-ray disc, DVD disc, Blu-ray folder, Blu-ray ISO files, DVD folder, DVD ISO files, 4K videos, 1080P HD videos and audio files for totally free. It offers one-click operation to play Blu-ray ISO file on Mac free. 1. One-click operation free Blu-ray ISO player for Mac users to play Blu-ray ISO file on Mac for free. 2. Play Blu-ray disc on Mac for free, regardless of disc protection and region code restriction. 3. .Virtual remote control supported for people to play Blu-ray disc and ISO file with hand free from computer. 4. Select subtitles and audio tracks from source Blu-ray files. Watch Blu-ray movies in familiar language. Get source Blu-ray ISO file ready on your Mac computer. Download free Blu-ray ISO player for Mac via the links above and install it on your Mac. Open this free Blu-ray ISO player for Mac and then click "Open File" to browse and add source Blu-ray ISO image file. This Blu-ray ISO player freeware for Mac would automatically play Blu-ray ISO file on Mac for free then. Make sure your computer is well connected to the Internet.